Source of Negative Ions by Cesium Sputtering (SNICS) - National Electrostatics Corp. The SNICS II is the most versatile negative ion source presently available. 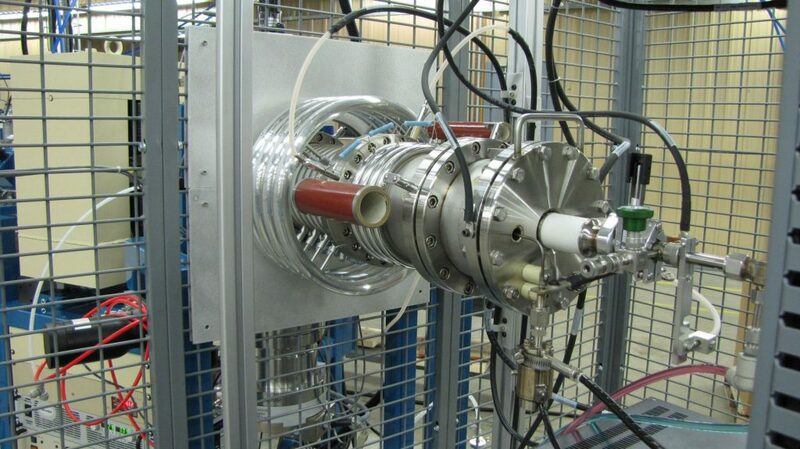 This sputter cathode source produces ion beams for all elements that form a stable negative ion. Its unique design and metal/ceramic construction with no organic seals in the main housing of the source has produced a reliable system with superior performance for all negative ions across the periodic table. Cesium vapor flows from the cesium oven into an enclosed area between the cooled cathode and the heated ionizing surface. When vapor atoms condense onto this heated surface, they become positive cesium ions, which are then accelerated and focused onto the front face of the cathode. The ionized cesium sputters particles from the cathode through a condensed cesium layer on the cathode face. The low electron affinity of the cesium favors the production of negative ions in the sputtering process, and those ions are accelerated back toward the ionizer, and focused into a negative ion beam. The SNICS II has an all-metal sealed main housing. The only o-rings are in the back of the cooled area on the cathode holder. This arrangement allows the body of the source to remain warm relative to the cathode. In addition, the volume around the ionizer and cathode is fully enclosed. These design considerations keep the cesium vapor in the volume required for maximum beam production. The SNICS II is equipped with a valve on the cathode holder assembly. This allows a cathode to be changed without disturbing the source vacuum. Only the bias voltages need to be turned off. 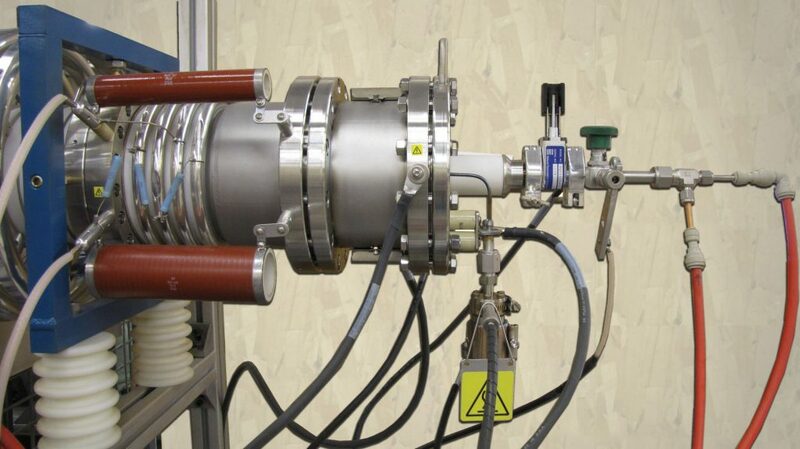 The cesium oven allows the insertion of the complete glass cesium ampule. The glass ampule is broken as the oven is tightened, eliminating the need to use an argon enclosure to fill the cesium oven. Customers report emittances of the resulting negative ion beam from a SNICS II source from 3-5 πmm mR (MeV)1/2 for 80% of the beam, depending upon the beam mass. This list is based on data from AT&T Bell Laboratories, the NEC test bench, and other contributing laboratories. All ion beam currents listed are measured after 30° or 45° mass analysis. The lifetime of the SNICS II is dependent on beam type and beam current produced. However, customers reported 3-6 months between source maintenance, except for cathode change. This translates into well over 1000 hours of beam production time. The lifetime of a cathode is highly dependent on the sputter rates. However, the source is designed to allow the change of a cathode without turning the source off. In Pelletron® systems, it is common to change a cathode within 10 minutes from beam on target to beam on target. Though the source is primarily designed for the use of solid samples, NEC offers a gas cathode assembly, which allows the insertion of gas through the center of a cathode. NEC also offers a multi-cathode SNICS (MC-SNICS) that can handle either 40 of 134 samples at a time. Please click here for more information on our MC-SNICS, or contact NEC for more information on available configurations for the SNICS.